When will be World's Biggest Shipbuilders next episode air date? Is World's Biggest Shipbuilders renewed or cancelled? Where to countdown World's Biggest Shipbuilders air dates? Is World's Biggest Shipbuilders worth watching? In vast shipyards across the globe elite engineers are joining forces to build a new breed of marine machines to do battle with the worlds roughest seas. Featuring in the series is a giant Maersk Tanker as long as 2 football pitches, a mighty Supertug with the power of 180 cars and the world's biggest jack-up drilling rig with legs towering more than 200 metres over the shipyard. Constructing these ocean giants on time and to spec are the ultimate test of team work and skill for the world's biggest ship builders.Meet the boundary-pushing crew of engineers, shipbuilders, captains and designers as they work to build, test and launch three of the world's most complex offshore assets. Working under extreme conditions, and tight deadlines, the teams toil to complete the assets and get them ready to access and transport oil. 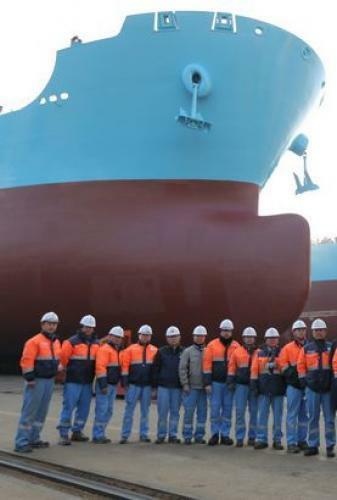 In the South Korean shipyards of Okpo and Sungdong, two teams are building a giant tanker– the Maersk Tangier, along with the world's biggest jack-up rig – the XLE4. The workers face one of the heaviest lifts any of them have ever attempted - hoisting a giant 3000 tonne leg well into position, with the help of the yard's floating crane. The Tangier is welded together from a hundred and twenty nine giant steel blocks. As the challenges increase for the tanker team, the rig team is also feeling the pressure. The construction of the vessel's bow and stern begins at two shipyards in Poland, but it's a bumpy start for the new build. Meanwhile in Korea, the XLE4's hull is being completed. In Norway, workers prepare for the delivery of the super tug's hull pieces. Back in South Korea, the Tangier is about to take to the open sea for the very first time. Finally complete, the Tangier has left port to begin her maiden voyage. On the other side of the world, the super tug team race against the clock to finish the build. World's Biggest Shipbuilders next episode air date provides TVMaze for you. EpisoDate.com is your TV show guide to Countdown World's Biggest Shipbuilders Episode Air Dates and to stay in touch with World's Biggest Shipbuilders next episode Air Date and your others favorite TV Shows. Add the shows you like to a "Watchlist" and let the site take it from there.